Ji’an, located in the middle reach of the Yalu River, is famous for rich historical and cultural relics from the era of Koguryo. Among regimes established by ethnic minorities in north China, Koguryo survived for the longest time from 37 B.C. to 688 A.D. with 28 rulers. For about 425 years of its whole 705 years, the regime took Ji’an as its capital. 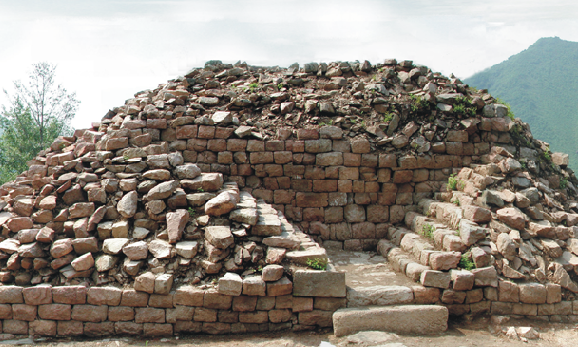 Therefore, as a center of the kingdom’s politics, economy and culture, Ji’an is left with many relics. The year 2004 witnessed that capital cities and tomes of the ancient Koguryo Kingdom was listed as a World Cultural Heritage. The scenic area is notable for the magnificent “Haotaiwang Stele”, the imposing imperial tomb of Changshouwang (also called the Oriental Pyramid), the distinctive Wandu Capital City and the stunning frescos inside the No. 5 tomb of the Wukui Mausoleum (called an art treasure of Northeast Asia). These relics demonstrate the distinctive, brilliant and creative civilization of the ancient kingdom. Besides, these relics enable the Koguryo scenic area to rank No. 2 among Jilin’s top eight tourist spots in 2009. Situated at the intersection of Jianshe Street and Yunshui Street, Ji’an Museum remains the first to focus on the Koguryo culture and history within and beyond China. The museum is built in the shape of a lotus with eight petals, reflecting China’s traditional theory related to geomancy and Koguryo’s preference for lotus and stone. Anyone with a desire to know the Koguryo culture and history should come to this museum to enjoy its more than 1000 pieces of historic relics. 100 yuan/person (including the Changshouwang Tomb, the Gwanggaeto Stele, the tombs of nobles in Yushan and the Wandu Capital City). Ticket price for each scenic spot costs 30 yuan/person. Free admission is given to persons in active military service and people aged 70 and above with valid certificates. Each scenic spot has a parking lot of over 2000 square meters to offer service for free. Scenic spots of the Koguryo scenic area are distributed in the areas surrounding Ji’an’s urban area. The tombs of nobles in Yushan, the Haotaiwang Stele (including the Haotaiwang Tomb) and the Changshouwang Tomb lie to the east of Ji’an’s urban area along the same tourist route. The Changshouwang Tomb and the Haotaiwang Stele are respectively about 4 kilometers and 2.5 kilometers away from the railway station. The tombs of nobles in Yushan is about 6 kilometers away from the railway station while the Wandu Capital City lies to the west of the city’s urban area, about 2.5 kilometers away from the passenger transport station. Tourists can start from the railway station, drive along the Yajiang Road for about 2 kilometers (the sign of the Koguryo scenic area can be seen) eastward and turn left to drive along the Jiqing road for about 0.5 kilometers to Gwanggaeto Stele. The Changshouwang Tomb can be accessed by driving another 1.5 kilometers along the Jiangjun road eastward from the Haitaiwang Stele. If tourists want to visit the tombs of nobles in Yushan, they should drive another 2 kilometers along the same road westward from the Changshouwang Tomb, then drive northward along the Minqiao road, then turn left (at No.3 bus station) to the Guoyuan road and then drive 2 kilometers before arriving at the Yushan scenic spot. Tourists can take No.3 bus in Ji’an’s urban area to the tombs of nobles in Yushan with 1 yuan for one seat. The first bus leaves at 7: 00 and the last at 4: 30 with an interval of 15 minutes.